Here is part two of Chelsea. 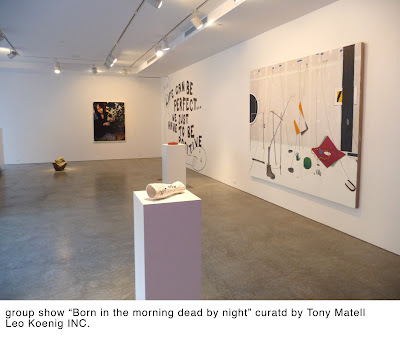 I first was able to see the paintings of Amy Sillman when living in LA at her 2005 show with Susanne Vielmetter. I missed her last two shows because of moving. 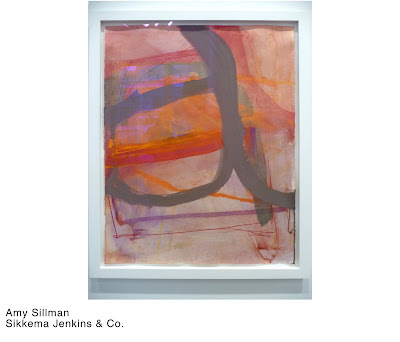 The works on paper on view at Sikkema Jenkins & Co are a welcome sight. They are in the project room and there are only a few up. 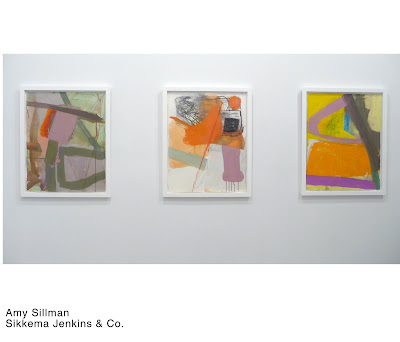 The thin vials of gouache provide a nice contrast to the oil paintings Sillman is known for. 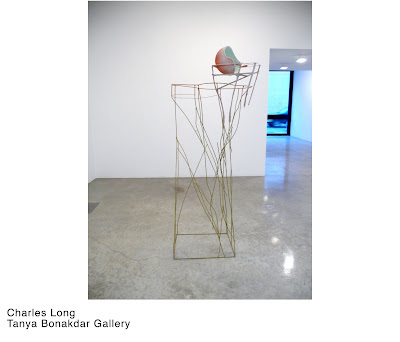 On view at Tonya Bonakdar Gallery is one time New Yorker now LA sculptor, Charles Long. 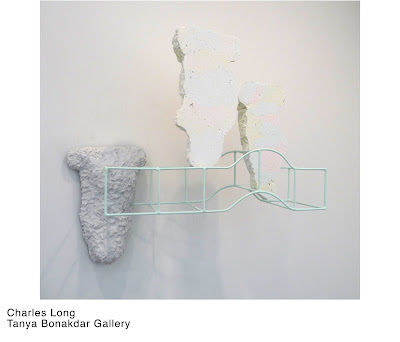 Long presents a new body of work. Color seems to have come in to play in a different way. 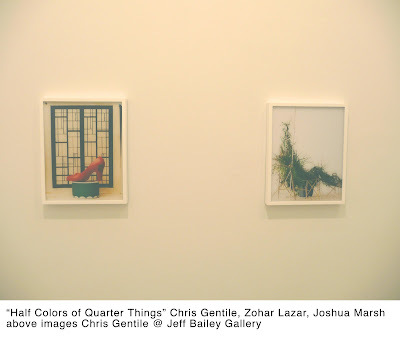 Aside from the piece at the Whitney last year, I remember the shopping cart piece titled "And Then So Clear" (2005) at Shoshana Wayne that was more found object-based and used the color of the objects themselves. 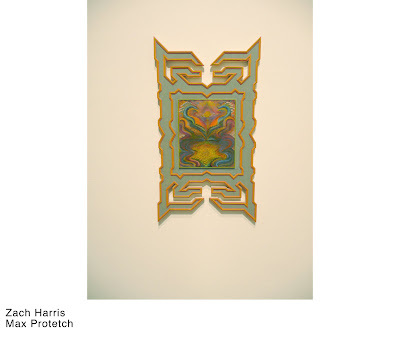 The piece seemed to have an apocalyptic theme – the world is ending and this is all that is left. 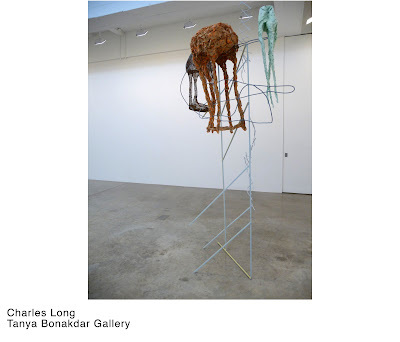 This new work uses a similar mode of fabrication; but the objects seem to come from another planet or time, and the formal considerations seem more crisp. Leaving the end of the world behind, this work seems like a post-apocalyptic new utopia. 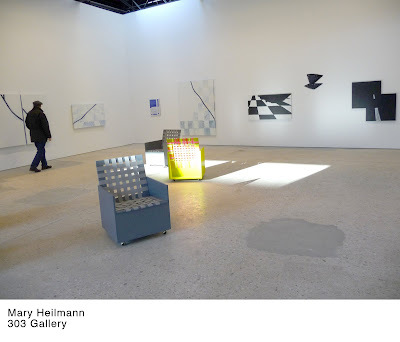 Fresh on the heels of her retrospective at the New Museum, Marrie Heilmann shows mostly new work in "Two Lane Black Top" at 303 gallery. 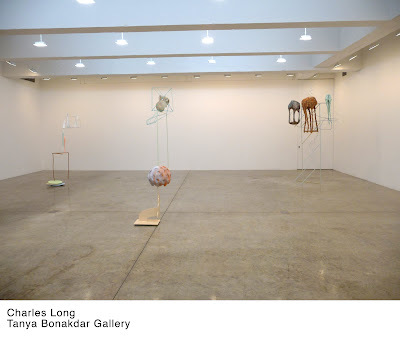 The overarching theme of the show is about space, both real and imagined – the space of the open road and all that is implied. The two lane black paintings seem to be the glue that hold the show together. They are my favorite paintings in the show because of how slippery theyare. They occupy multiple meanings and spaces all at once. 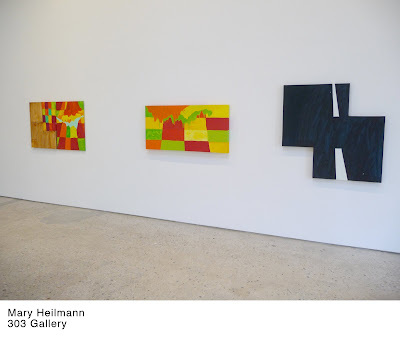 I think that is what Heilmann seeks to do anyway, and these paintings do it well. 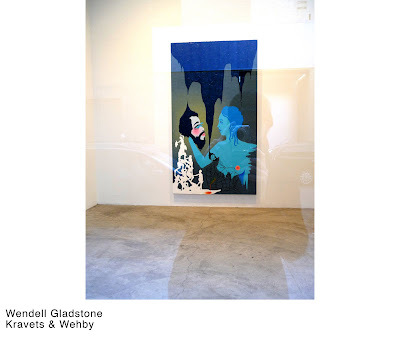 My old friend Wendall Gladstone has a new painting up at Kravets and Wehby in what is usually is the Matthew Marks project space. 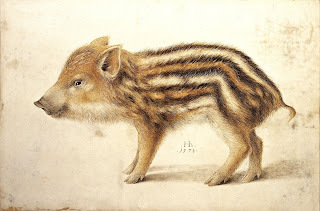 It's a great paining and Wendall never ceases to surprise me! A friend highly recommended I see this show, and I'm glad they did. 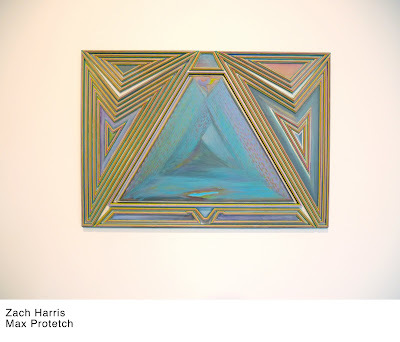 Zach Harris's work at Max Protetch are equal parts painting and sculpture, and bazaar in the best of ways. 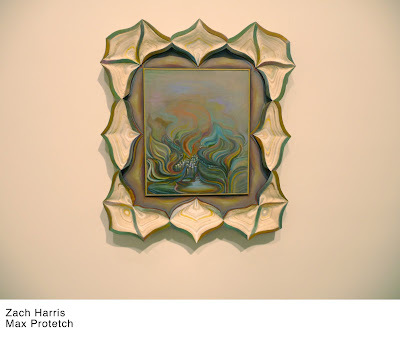 They can almost act as contemporary devotional objects from a modern day visionary. All of the supports are handmade out of painted wood. The work operates on many levels and references work spanning the last couple thousand years of human history both east and west. 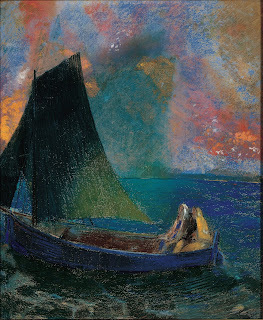 A new exhibit at the Met, Raphael to Renoir: Drawings from the Collection of Jean Bonna, reaffirms (as if I needed it reaffirmed) my love for drawing. 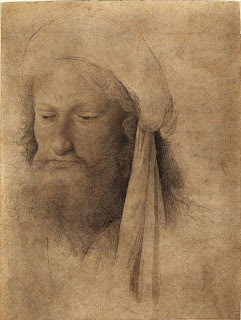 Drawings, it seems to me, play their cards face up on the table, no matter how exquisite they are. They always let you in and standing there in front of it, not to get too romantic about this, the drawing becomes a conduit for empathy- you can step into the artists mind at the moment s/he was making it. It's a new year and I have a new camera. 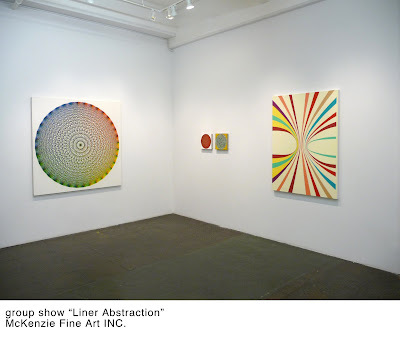 I recently made the rounds in Chelsea and saw too many shows for one post. I decided to break them up into different parts, so be on the look out for part 2 and a post on the LES. 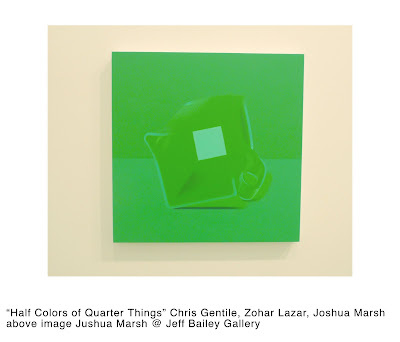 "Half Colors of Quarter Things" starring Chris Gentile, Zohar Lazar and Joshua Marsh at Jeff Bailey go together like peas, carrots and mashed potatoes. The selection of these three artists was a smart one. I was delighted to see how each work played into the others. 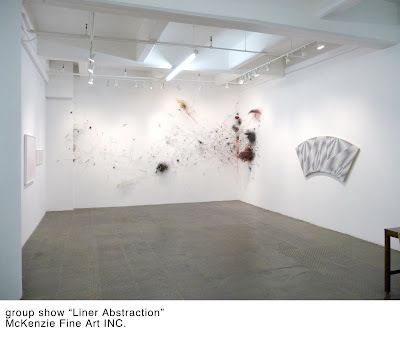 "Linear Abstraction" is a group show at McKenzie Fine Art INC that explores the range to which line can be used to make art. 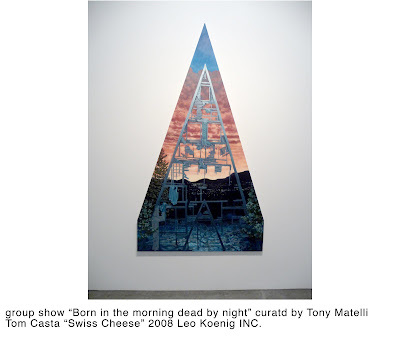 Process, hard edge, op and installation are means by which this art is made. 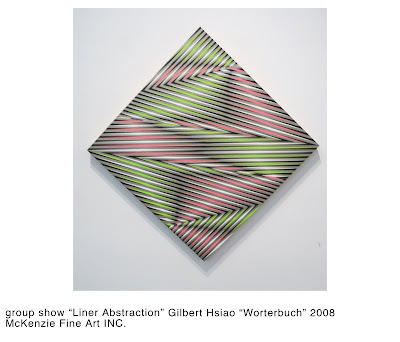 The linear abstractionists are Mark Dagley, Gilbert Hsiao, Maureen McQuillan, Gelah Penn, Gary Petersen and Mary Temple. 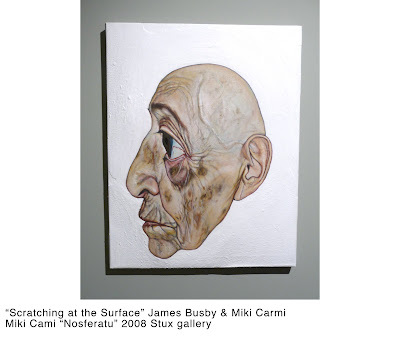 "Scratching at the Surface" is James Busby and Miki Carmi at Stux Gallery. 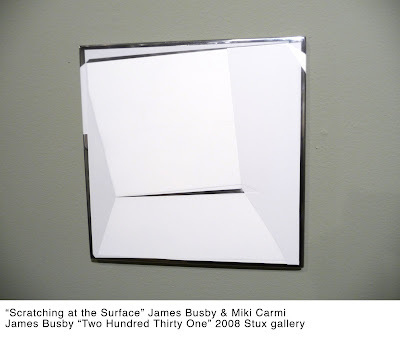 Both artists use plenty of white in their work to remarkably different ends. 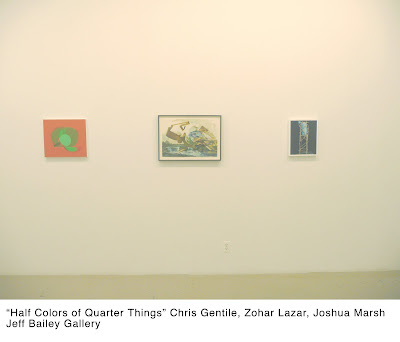 While spending time with the show I enjoyed how the quietness of the work amplified the differences. The play between the differences in surfaces and touch also make for pleasurable viewing.